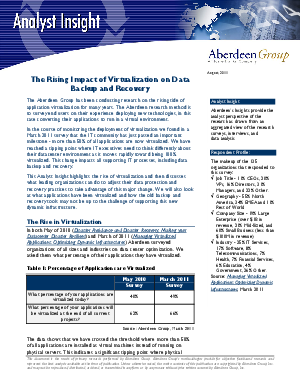 The Aberdeen Group has been conducting research on the rising tide of application virtualization for many years. In the course of monitoring the deployment of virtualization, they found in a March 2011 survey that the IT community has just passed an important milestone - more than 50% of all applications are now virtualized. We have reached a tipping point where IT executives need to think differently about their datacenter environment as it moves rapidly toward being 100% virtualized. This change impacts all supporting IT processes, including data backup and recovery. This Analyst Insight highlights the rise of virtualization and then discusses what leading organizations can do to adjust their data protection and recovery practices to take advantage of this major change. It also looks at what applications have been virtualized and how the old backup and recovery tools may not be up to the challenge of supporting this new dynamic infrastructure.